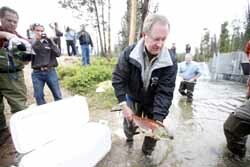 U.S. Sen. Mike Crapo, R-Idaho, releases a spawning sockeye salmon into Redfish Lake Creek south of Stanley Wednesday morning. The salmon was one of approximately 1,400 expected to return to Redfish Lake this season, which would be the highest number of sockeye to return to the area since the 1940s. The fish are typically caught at traps at Redfish Lake Creek and the Salmon River, where they are counted and then transferred to the lake. Crapo joined Idaho Fish and Game Commissioner Wayne Wright and other representatives from the Idaho Department of Fish and Game, National Oceanic and Atmospheric Administration Fisheries, the Bonneville Power Administration and conservation group Idaho Rivers United for the ceremonial transfer.